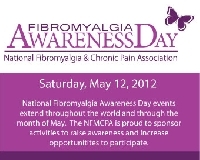 National Fibromyalgia Awareness Day is May 12th, 2012. How about a swap which feature the awareness ribbon which is purple.Send your partner something like a small leaflet explaining fibro in laymans terms, how it affects you or someone you know, what you have learned about it, etc. Then something handmade or purchased which features the ribbon i.e. pin, bracelet, ATC, notecard, phone charm, bookmark, etc. This swap is open to all members of swap bot. The swap idea was submitted by Fibro Sisters Group member ChesterSarah. Thank you for this great idea!! Together we can Make fibromyalgia visible! What a great idea & theme! Thank you nlgrudis, ChesterSarah & Fibro Sisters Group! I too have fibromyalgia & I'm aware of National Fibromyalgia Day. This swap I'd like to participate in, however, I can down with a virus during Easter weekend. The virus is slowly going away. It has weakened me (colds, flu's, viruses, all seem to aggrevate my fibromyalgia,) & I don't know when I'll feel enough energy to participate. I will watch the Fibro Sisters Group to see if there is a swap for next year's National Fibromyalgia Awareness Day. I to have fibro, in Australia we are not [well I am not] aware of a special day but I would like to be in this swap, I can do something in the colour. O what a wonderfull idea; Here in Belgium we are not aware of a special day. I also have fybromyalgia in the highest degree and doctors even doesn't know any more what to do tho take away the pain. Please can you let me know where I could find that ribbon. I would love to make one, but I realy don't know how it look's like. I think I'me going to sign in for this one; As I'me on a holliday for a whole month, I think I'll can manage to make one ribbon. Stupid me. I had to drop me from this swap. As I'me on a holliday and will not have acces to internet I wan't be able to assist at this swap. It's a pitty. I realy would have loved to sign in for this one. Sorry, it will be for the next year if im still a live.